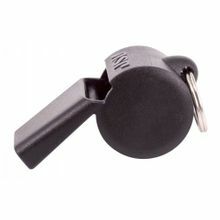 ASP Whistle from the leader in quality police gear. The engineering polymer of the Alert Safety Whistle is extremely strong, yet feather light. The Alert may be attached to a keyring or lanyard by the chrome plated split ring. The black whistle is available alone for every day carry. The piercing tone of the Alert is the result of advanced sound engineering, a Spanish cork ball and rigid frame design. The sound is distinctive and intense. This safety device has been around a long time and here it is condensed into its smallest most convenient form. Everyone notices the sound of a whistle, instinctively. If you need to attract some attention, this will surely help. A lanyard is not included, but available for purchase simultaneously from the drop down menu.